Remember the Langelier Saturation Index (LSI)? It's an index that accounts for temperature, pH, alkalinity, calcium hardness, stabilizer and TDS. We have test kits that test for all that stuff.... but how often do you actually test water temperature? Oh, you don't? Until we understood the LSI, neither did we. Well as it turns out, water temperature matters. A lot. For more information explaining pH, Alkalinity, Calcium Hardness and how they relate to the LSI, read this. The vast majority of damage done to a pool--including its plaster surface and equipment--occurs during the winter and/or initial filling. Etching and corrosion are more likely to happen in cold water than warm. But why? Those crystals in there are not calcium carbonate (scale). But they are calcium-based, and came from the plaster surface! That's calcium that belongs in your plaster...but since the water was cold and the LSI was low, the water extracted this calcium right out of the walls. The LSI is the balance between corrosion/etching (negative LSI) and scale formation (positive LSI). If the temperature is lower, the LSI will be a lower number. If it's MUCH lower, the LSI change can be severe. For example, let's say the normal temperature of the pool during the summer is 84ºF. What happens in the winter, when the water gets down to 32ºF and freezes? What about initial fill from the hose, which is usually around ground temperature (~55ºF)? For these situations, let's use Orenda's LSI Calculator app. Changing nothing but temperature from 84º to 55º drops the LSI from nearly perfect to corrosive. 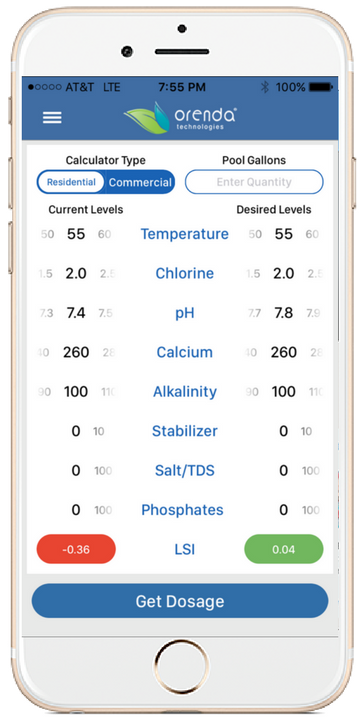 We created a bilingual (english/espanõl) mobile app calculator designed to give both chemical dosing and LSI readings. It works like this: input your current water readings on the left side by adjusting the dials. The LSI number at the bottom will automatically adjust to your numbers as you go. On the right side, adjust the dials to where you want your water to be. There also, the LSI will update as you adjust the dials. Put in the gallons of the pool and click "get dosing" at the bottom, which will bring you to the results page. As an educational tool, you can just play around with chemistries on one side or the other, and watch what the LSI does. Most notably, look at the impact that water temperature has on it. Unless you're filling the pool with water from a truck that has been sitting in the sun for hours, most fill water comes through pipes in the ground (garden or fire hoses). Depending on where you live, ground temperature can vary some, but usually it is around 55º F. In our experience, when we measure temperature of fill water, it is usually within a couple degrees of 55º. If you have no water thermometer, we recommend you buy one and use it before every fill. 55º F is pretty cold, and it impacts the LSI in a big way. For bather comfort, good water temperature is between 80-90º, with competitive swimmers on the low end of that spectrum, and leisure swimmers on the high end. In a warm, sunny climate, the temperature of the water may climb well into the 90's. Keep track of it when you visit the pool, because as we learned before, calcium prefers cold water. If the water gets that warm, it's much easier for calcium to fall out of solution and form scale, as indicated on the LSI calculator. The nice thing is, if you form scale, it can be corrected with chemistries like sequests and adjusting alkalinity and pH. If you etch plaster or corrode equipment, that's permanent damage. It's always best to be in the 'green zone' of healthy LSI (as shown in the Orenda Calculator), but if you're going to err, err to the high side of the LSI, never the low. we can simply let the pH drift up to bring the LSI back into a safe range. If you're in a climate that freezes, pool owners deserve proper water chemistry to compensate for the ultra low temperatures. Bringing the temperature down on the LSI calculator, for instance, requires a higher-than-normal pH and/or alkalinity during the winter to prevent corrosion and etching. 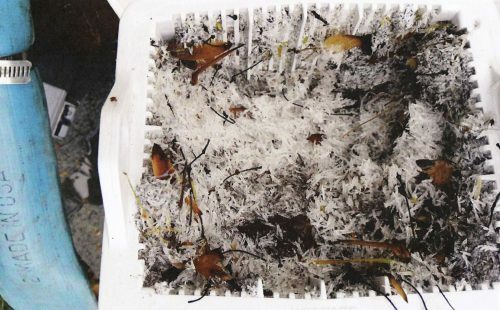 We also suggest using a sequest during the winterization process (we have a pretty good one). 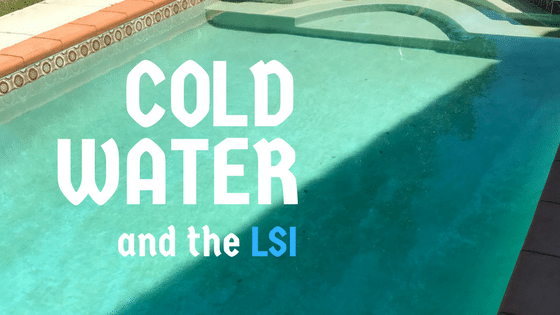 If you're managing pools during cold season, please, for your customer's sake, stop and check the LSI calculator first. 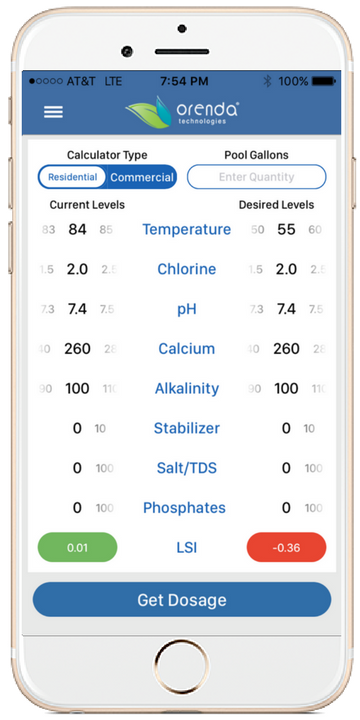 When water gets colder, the pH will need to be higher than normal, but use the calculator to find out what works for you. We all need to rethink how we treat pools year round, and make sure we are within the safe range of the LSI throughout the year. LSI violations are the number one cause of plaster and equipment damage. At the risk of repeating ourselves too many times, let's leave it here: pay attention to the LSI, especially in the winter.